Blueberries are a delicious summer treat, offering numerous health benefits from anti-aging antioxidant vitamins such as Vitamin C to a dose of fiber with each bite. Growing your own blueberries can offer even more health benefits, as you have control over any pesticides or chemicals that are put on the plants. To produce healthy blueberries, the plant needs a strong root system, and staking the plants when they are young is one way to be sure they get one. If the plants are not staked, they can be blown about by the wind and fail to develop healthy roots. Staking your blueberry plants is a simple process that is worth the small investment. Purchase three garden stakes that are at least 2 feet taller than your blueberry bush. While many staking instructions suggest only two stakes, using three stakes on a blueberry bush assures you that it will hold up to the wind, no matter which direction it is coming from. Mark where you will insert your stakes into the ground by digging a small hole into the dirt. Do this in a triangular formation, so that the blueberry bush is in the center of the triangle. The stakes should be put into the ground at a distance of 8 inches from the plant's outermost branches. Loosen the top of the ground where the stakes will be inserted. Use a small spade or cultivator to do this. Pound the stakes into the marked spots. Use a heavyweight hammer and make sure the stakes go into the ground at a depth of 6 to 12 inches. Tie the loose end of the clothesline rope to a plant stake. Clothesline rope is used because it is thick and soft and will not cut into the plant's branches. Take the loose end of the rope and pull it over to the blueberry bush, around the heaviest center stem, and then back to the plant stake. Be sure the rope is a bit loose, so that the blueberry plant has 1 inch of free space to move with. Secure the loose end of the rope to the plant stake and cut off the excess with scissors. Repeat this process with the other two stakes. 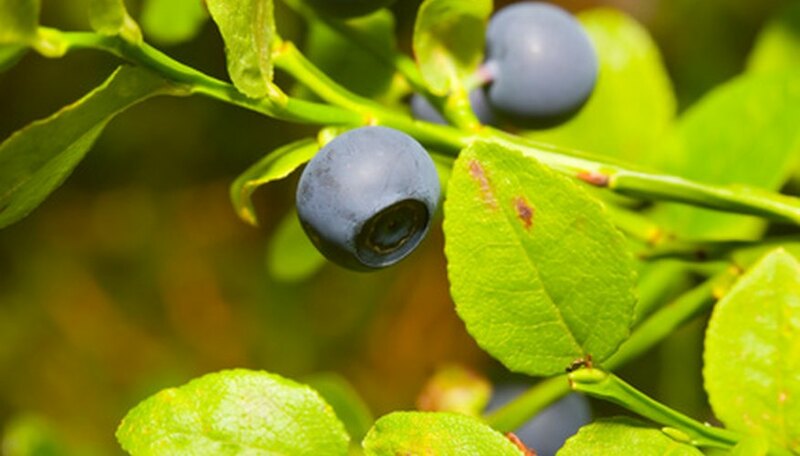 Stake your blueberry bushes as soon as they are planted, as this will help minimize damage to roots that could occur if you wait until they are older. Blueberry stakes should be removed after one year, as long as your plants look strong and healthy. Do not tie the rope to the plant--only to the plant stake. Tying the rope to the plant increases the risk of breaking a branch.